World War I, also known as the First World War and The Great War, was waged primarily in Europe from 1914 to 1918, but spilled over into Africa, the Middle East, and the Atlantic, Indian and Pacific Oceans. On one side of the war were the Central Powers: Austria-Hungary, Germany, Bulgaria, and the Ottoman Empire. The major Allies consisted of the British and French Empires, the Tsarist Russian Empire (until 1917), Italy, Japan, and after 1917 the United States. World War I saw the first use of poison gas, large artillery, armored tanks, and airplanes. It was a "total war" because the governments involved took control over the economy and factories, giving first priority to the goods needed for war. Wage and price controls were imposed, there was rationing of goods for civilians, and free speech was limited. The governments put out propaganda to maximize support for the war and dislike of the enemy. Many of the techniques of population manipulation and central government control which we see today were first pioneered by European powers during World War I. For a more detailed treatment, see Causes of World War I. On June 28, 1914, a Serbian nationalist group of assassins known as The Black Hand, killed the Austrian Archduke Franz Ferdinand and his wife Sophie in Sarajevo. This action led to Austria-Hungary giving an ultimatum  to Serbia. Serbia agreed to comply with all of the demands, except the ones which violated their sovereignty, and, due to a number of military alliances throughout Europe, a full-scale war was soon in progress. Serbia requested support from its ally, Russia, which mobilized its military forces. This mobilization led to Germany invading both Russia and France (which had an existing alliance with Russia), which immediately committed Germany to war on two fronts. En route to France, German forces passed through neutral Belgium. The violation of this neutrality led Britain to declare war on Germany. Italy had an alliance with Germany and Austria-Hungary, but refused to join their war effort (partly because of a secret treaty between Italy and France signed in 1902) and joined the war on the Allied side on 23 May 1915. Alternative theories cite the building of the Berlin-Baghdad railway and the problems it would have created for England. The quandary facing strategists through most of the war was how to reinstate mobility. The sheer size of the Eastern front made trench warfare unfeasible, creating a fluidity there that generals sought for the Western Front as well. The Germans took the first step on January 3, 1915 when, in contravention of the Hague Convention of 1899, which outlawed the use of poisons in war, they employed gas warfare at Bolimov, on the Eastern Front. This attack was largely ineffective, however. The Germans had used xylyl bromide, a non-lethal, but lachrymatory (tear-producing) gas, but it froze in the sub-zero temperatures. But, by April of that year, the Germans had an abundance of lethal chlorine gas that overstimulates fluid production in the lungs, drowning the victim. The first effective gas attack, using chlorine, was launched by the Germans at Ypres on April 22, 1915. Fortunately for the Allies, the Germans viewed gas attacks as an experiment, so the attack was conducted on a relatively small scale. After the usual artillery bombardment, that preceded almost every battle, the greenish-yellow gas began drifting into the Allied trenches, which were occupied by French and Canadian troops. Many were killed almost immediately, and the French troops panicked, fleeing the their trenches, opening up a four-mile wide gap in the lines. However, tenacious resistance by the remaining troops prevented the Germans from making any great gains, as well as the lazy winds which did not move the gas cloud fast enough to stay ahead of the advancing Germans. The attack was still somewhat successful, as it did flatten the curve of the Ypres salient, and the potential gains were enormous, if only the Germans had launched a larger attack. The Germans launched another gas attack on 24th, forcing the Allied line into a three-mile retreat. But the Germans had made a major mistake: the inaugural gas attack on the 22nd was too small-scale, and the success it had would not be repeated, for the Allies were now prepared. The gas was quickly recognized as chlorine and a Canadian Lieutenant, remembering that chlorine is water-soluble, ordered men to cover their faces with wet cloths, which greatly diminished the effectiveness of the gas. The Allies quickly developed gas masks and their own gas, phosgene. The Germans then responded with mustard gas, a vicious vesicant that blisters the skin and lungs. Gas had restored mobility to a certain extent, but there was still the problem of wire barriers. Cutting barbed wire was a serious tactical problem. In Gallipoli, Allied forces had attempted to destroy wire with artillery bombardments, but shells only exploded upon hitting the ground, which usually only served to create further entanglements. The French produced a solution in 1915, with a new kind of fuse called the Fusée Instantée Allongée (elongated instantaneous fuse), containing a brass tape that unwound during flight. Once unwound, it freed the hammer, and when the shell hit the ground, this triggered the detonator, setting off the primer and exploding the shell. British inventors made some changes to improve its safety, reliability and suitability for mass production, resulting in the Type 106 percussion fuse. The final product was a shell that exploded on impact with all but the softest ground. The explosion produced no crater, dispersed high-velocity steel splinters over the ground, which were lethal at 800 metres. Hence the infantry called them "ground shrapnel" or "daisy cutters". This new fuse bode well for a solution to the wire problem. With wire resolved, there still remained the problem of what lay behind it: machine guns and rifles, manned by entrenched soldiers. It was necessary to get men past the wire to enemy trenches without costly frontal assaults. This would be possible by protecting the attacker with a mobile bulletproof shield, as such a shield would be too heavy to carry. To accomplish this, the Allies introduced the ‘tank,’ as it was code-named, in 1916. The intention was to restore power to the offensive by combining firepower, protection and movement. The first two were often stressed to the detriment of the third; the tank's average speed was five miles per hour. They were used sparingly at the Somme and had little effect until used en masse the following year. The first major tank deployment was at Cambrai in November 1917, when the British launched a 318-tank attack on German trenches. Since the wire posed no threat to the tanks, the customary artillery bombardment to attempt to remove it was unnecessary, and it ensured surprise. The tanks penetrated three German lines, advancing eight miles. The attack was an unmitigated success, although the enormous success was also a drawback: the Allied tank columns advanced so rapidly that they outdistanced supporting infantry and cavalry, and were forced to halt their advance. "Everything I had feared, and of which I had so often given warning, had here, in one place become reality… The 8th of August put the decline of our fighting power beyond all doubt… The war must be ended." However, tanks did not immeditately revolutionize warfare. Historian Ernest Swinton described the role of the tank as “purely auxiliary to the infantry, and are intended to sweep away the obstructions that have hitherto stopped the advance of our infantry beyond the Germans’ first line and cannot with certainty be disposed of by shell fire.” Tanks were certainly an effective weapon in breaking trench lines, but were not independently decisive. Swinton’s description was mostly accurate, except for the part about destruction by artillery. While the tanks were heavily armoured, they were exceedingly slow, and moving over rough terrain slowed them further, making them easy targets for artillery. Indeed, many tanks were destroyed before generals realized that they could only be truly effective if working in cooperation with infantry and artillery. There was one area in which tanks could be said to be the most important, that being psychological warfare. German officers recorded that their troops “felt powerless to stop the tanks,” and while this is not entirely true, the tank was a formidable-looking machine. Military theorist and historian General J.F.C. Fuller notes that the tank was “a psychological, more so than a material weapon.” This concept, of the tank as a fast-moving weapon suited to destroying an enemy's will to fight by psychological shock, was to be developed between WWI and WWII by Fuller, Basil Liddell-Hart, Georgi Zhukov, Konstantin Rokossovskiy and Heinz Guderian, culminating in the manouevre warfare doctrine used by Germany in WWII and NATO up to the present day. World War I consisted mostly of trench warfare. This method of waging war was very slow and messy. Soldiers might wait in their trenches for weeks, only to advance a few feet and wait in a new trench. Unfortunately, this became a necessity, as air forces were in their infancy, and the first combat tank only saw action by August 1916. There were several important battles which were fought before America joined the war. By the 5th of September, 1914, the German invasion of France was going so successfully, that French and British forces were in a general retreat towards Paris, with the German army hot on their heels. Just prior to the battle, the two main German forces, the 1st and 2nd German armies, had split up to attack the French 5th and 6th armies, respectively. The regiments of the British Expeditionary Force were pushed in between the two German armies, acting as a wedge, allowing the Germans to be outflanked. Following that, the French 5th army launched a surprise attack, eventually forcing the German army to retreat, stopping after having marched 40 miles. A number of unofficial cease fires took place, allowing both sides to dig their own trenches, setting the tone for the rest of the war. The Western allies took 234,000 casualties, while the Germans took just over 220,000. France still refers to this battle as "The miracle of the Marne" to this day. In 1915, Winston Churchill, then First Lord of the Admiralty, proposed a daring plan to attack the Dardanelles, a narrow section of ocean south of what is now Turkey, in order to open a supply route to Russia. Unfortunately, he made his plans based on bad intelligence. A preliminary attack was launched in February 1915, bombarding artillery of the Ottoman Empire. However, in March, a fleet of British and French warships attempted to navigate the Dardanelles and ran into mines at its narrowest point (which is only a mile wide). The British and Churchill, not wanting to admit defeat, diverted British, Australian, New Zealander and French troops from training in Egypt to their campaign in Turkey. Putting together an amphibious Allied force, a plan was put together to land on the Turkish peninsula of Gallipoli on April 25. Although the Allies greatly outnumbered the Turks, poor counter-intelligence efforts by the Allies allowed the Ottoman Empire to resupply and reinforce the Gallipoli peninsula. Additionally, the Allies did not understand the terrain adequately and suffered from limited knowledge of their enemy. The Turkish soldiers were also very tenacious and very able fighters. However, the bloody-mindedness of the British commanders led to nine months wasted on the peninsula, with 44,000 deaths among over 100,000 casualties before their successful withdrawal, which was completed by January 9, 1916. In 1916, the Battle of Verdun between the French and Germans may have been the most demanding battle in world history. The struggle started when the Germans attacked Verdun, France, a city surrounded by a ring of underground forts. At least 220,000 soldiers died, and at least 480,000 were wounded in this 10-month struggle that accomplished nothing. At the end the front lines were in nearly the same locations as at the beginning. A subsidiary offensive of the 1916 Somme Offensive, the Battle of Flers-Courcelette marked the debut of tanks. Twelve British divisions and 50 tanks charged into battle on September 11, 1916, but gained only a mile of ground. Although the tanks were impervious to small arms fire, they were extremely slow, difficult to navigate and often bogged down in the thick mud on the Western Front. Also in 1916, and also in France, the British and French armies met at the Somme River and began a massive attack on the Germans in order to distract them from Verdun. This became the Battle of the Somme, and the fighting was even heard across the British channel in England. First the Allies shelled the Germans to weaken them, and then 100,000 British soldiers charged the enemy. But the shelling did not have its intended effect, as the Germans were dug in too deeply to be affected by it. On July 1, 1916, the Germans killed 20,000 of the British soldiers and wounded over 40,000, making it the single worst day in British military history. This battle, which did not succeed in moving trench lines, eventually involved over 2 million men along a 30-mile front. The British and French lost nearly 750,000 men. For 18 months the British hid 19 huge land mines underneath the German lines southeast of Ypres, Belgium, a location that had already seen battles in 1914 and 1915. The British then detonated those massive mines, and charged the German positions in July 1917. At first the strategy worked, as the Germans were confused and disorganized. But the British did not pursue the Germans as quickly as they should have. Rain began to drench the area in one of the wettest fall seasons there in years. Soon the British forces were stuck in a mountain of mud, and this Allied plan was yet another failure. For the first three years of World War I, the United States attempted to stay out of the war, but try to act as a mediator. Mediation failed. When the Germans used a U-boat to sink the British ocean liner Lusitania in 1915, killing over one thousand civilians including some prominent Americans, the Americans were outraged. Badly hurt by the British naval blockade of Germany, which cut off food supplies, the Germans wanted to retaliate. In early 1917 they decided they could defeat Britain and France by cutting off all supplies. They could only do this by sinking merchant ships without warning, which violated international law and their repeated promises to the U.S. Berlin knew it meant war with the U.S. but moved anyway. At the same time Berlin invited Mexico to form a military alliance and fight the U.S. Publication of the Zimmerman Telegram was a casus bellum" (cause of war). The Mexicans wisely ignored the proposal but American pubic opinion was outraged. German U-boats now began sinking American ships on sight. 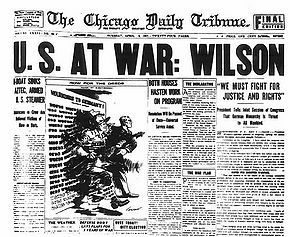 On April 2, 1917, President Woodrow Wilson spoke in favor of declaring war on Germany in an address to the joint houses of Congress. Congress then formally declared war on April 6, 1917, with opposition votes coming mostly from areas with large German ethnic populations. The Army was expanded by a factor of 100 to 4 million soldiers (all men), and a major expeditionary force was sent to Europe called the American Expeditionary Forces, under command of General John J. Pershing. Officially the U.S. did not join the Allies and there was no treaty or formal agreement with Britain or France, so Pershing was practically independent. He was also largely independent of Washington, and allowed to make his own strategic and command decisions. In 1917 Russia suffered two successive internal Revolutions which would later caused it to withdraw from the side of the Allies and leave the war altogether. The February Revolution overthrew the centuries-old monarchy of the Tsar; the October Revolution installed the communist Bolshevik Party under V.I. Lenin. The lack of success against the German and Austrian Empires, and the hyperinflation caused by unsustainable military spending by the Russian government led to much internal discontent and economic chaos. Losses and hardship of the war had weakened Russian Czar Nicholas II. He abdicated the throne in March 1917 in favor of a provisional government headed by Alexander Kerensky. Hopes for a democratic revolution still existed at this time. But in October 1917, Vladimir Ilyich Lenin, and the Communist Party, which was never strong enough to challenge the Czar, overthrew the fledgling provisional government. The Communists later executed every member of the Czar's family including the children. Lenin became the founder of the Soviet state. He was both a writer and a revolutionary, a rare combination. He was the brother of the "bomb thrower" Alexander Ulyanov who was hanged for his involvement in terrorist activity and an assassination attempt on Czar Alexander III in 1887. An atheist, he became a Marxist in 1889. He obtained a law degree shortly afterwards, and by 1895 was a subversive who was arrested and sent to the Tsarist gulag along the Lena River in frigid Siberia where he adopted the name Lenin after the place of his internment. Once he served his time he left for Zurich, where he developed his ideas further and became a leader of the Bolsheviks. He was returned to Russia by the Germans in the wake of chaos during the Kerensky regime with the hope to led the Bolsheviks to power and negotiate a peace settlement with the Germans. After the Treaty of Versailles failed to recognize the settlement between Germany and the Soviet Union in the Treaty of Brest-Litovsk, he then ruled the Soviet Union and imposed a system of Marxism-Leninism (communism) that remained in force there until Stalin's rise to power. The exit of Russia allowed Germany to shift a majority of their troops from the eastern front to the western front. This gave them a final chance to try and break the Allies before the Americans arrived. Known as Operation Michael, the German offensive began in March 1918. The Germans launched five major campaigns in a four-month period in 1918 on the Western Front. The Germans had technology and lots of energy. They had elite storm-troopers with automatic rifles, light machine guns, flame-throwers and artillery fire. They used poisonous mustard gas lavishly. They easily defeated the vastly outnumbered British Fifth Army. The Germans were advancing and taking property. But a combination of fresh American troops arriving on the scene, and a failure in German supply lines was soon to halt the Micheaal offensive. In the Second Battle of the Marne in July 1918, the Allies started winning. Nine American divisions fought in this battle about 75 miles northeast of Paris. The Germans started this battle on another one of their offensives, but the Americans valiantly turned the tables and enabled the Allies to win it. Casualties were enormous for everyone, including the Americans. Former President Teddy Roosevelt’s son Quentin was killed in this battle. American Capt. Jesse Woolridge, 38th Inf., 3rd Division described the battle as follows: “It’s God’s truth that one Company of American soldiers beat and routed a full regiment of picked shock troops of the German Army ... At ten o’clock ... the Germans were carrying back wounded and dead [from] the river bank and we in our exhaustion let them do it - they carried back all but six hundred which we counted later and fifty-two machine guns... We had started with 251 men and 5 lieutenants...I had left 51 men and 2 second lieutenants." In January 1918, Wilson proclained the Fourteen Points, which an idealistic vision of world peace that strengthened the peace movement inside Germany and Austria and promised ana alternative to the increasingly despised monarchies. As the Americans and the Allies advanced toward Germany, the Ottoman Turks and Bulgarians surrendered. There was a revolution in Austria-Hungary that overthrew its government, and Germany would not recognize that new government. Kaiser Wilhelm II abdicated his throne in Germany on November 1918, and the Germans formed a new republic. Members of the German republic signed an Armistice (agreement to stop fighting), which was tantamount to surrender. The Armistice took effect at 11:00 AM on November 11, 1918. The "war to end all wars", was over. Austria-Hungary was dismantled, mostly along ethnic lines. The Ottoman Empire was also dismantled. For the first time in over 1000 years Palestine was not under Muslim control, as Britain assumed control of the area as a colony. Germany was forced to sign the Treaty of Versailles accepting full responsibility for the war and had to pay for the entire cost of the war. This led Germany into economic collapse and sowed the seeds for anyone who could get them out of this collapse and restore their pride to be view as almost a savior. Italy felt they were shortchanged in their portion of the spoils and led to a bitterness that would cause them to side with Germany in the years ahead. The initial causes of the war, alliances and imperialism, were not dealt with. Only 20 years after the Treaty of Versailles, World War II would start. On the cultural level, World War I represented the end of the Enlightenment movement in Europe, opening the doorway for cultural movements such as avante-garde, absurdism, and other artistic forms questioning moral absolutes. These movements justified their relativistic stance by pointing out the horrors of war, which caused them to question the concepts of human goodness within the world. The currents set in motion by this continue to the present day. June 28 In Sarajevo, Serbia, Austria-Hungary Archduke Franz Ferdinand is murdered. The Black Hand is responsible. September 6–10 Battle of the Marne, France- Germany is defeated by France. Both sides dig in. October 29 Attacking the Russian Black Sea Fleet, Turkey enters the war. The unprecedented scale and barbarity of World War I inspired a great deal of enduring art and literature. Many soldiers produced written or visual works based on their first-hand experiences on the front. Many of the belligerents in WWI commissioned artists to produce paintings and other works as a means of propaganda, many artists produced independent works reflecting the horror of the battlefield. The war also triggered the advent of several new artistic genres, including Cubism, Futurism, Expressionism and Abstract Art. Notable artists of this period include John Singer Sargent, Wyndham Lewis, John Nash and Muirhead Bone. Some of the most famous Western books and poems were inspired by the war, and most were written by soldiers. Notable works include Erich Maria Remarque's All Quiet on the Western Front, an anti-war novel written from the point of view of German soldiers. When published in 1929, it quickly became the best-selling novel of the 20th century and is widely regarded as one of the finest war novels ever written. Siegfried Sassoon, Ivor Gurney and Wilfred Owen were other prominent war writers; Owen's Anthem for Doomed Youth and Dulce et Decorum Est are two enduring war poems. Another significant work is In Flanders Fields, penned by Canadian medic John MacRae. Jeffers, H. Paul. Ace of Aces: The Life of Captain Eddie Rickenbacker (2003). 352 pgs. Lyons, Michael J. World War I: A Short History (2nd Edition), 1999. Stone, Norman. The Eastern Front, 1914–1917. 1975. Tucker, Spencer C. Tanks: An Illustrated History of Their Impact. ABC-CLIO, 2004. 379 pp. ↑ The Conduct of War by J.F.C. Fuller, p. 176-177. This page has been accessed 79,070 times.